Mangoes are the right choice for summers. We can easily say that summers are the best to make ice-cream, kulfi, pickles and papads too. However, we can also have this during winter too. There are many ways of making Kulfi. You can use condensed milk, evaporated regular milk or also yogurt/curd to make tasty kulfi. To give it different flavour, you can add mango pulp for making mango kulfi, use grapes for making yogurt grapes kulfi or strawberries for adding another flavour. 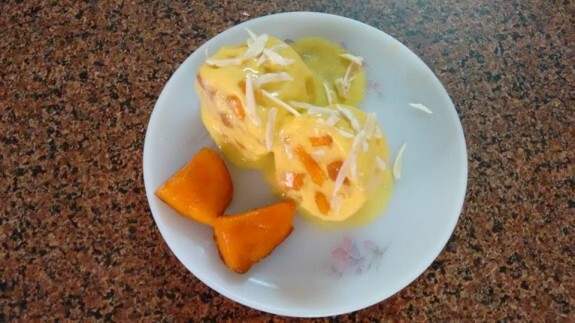 So, check out this mango kulfi and get a creamy texture yummy recipe. 1. Take milk on heavy bottom pan and simmer the heat on low flame for about 15-18 mins. 2. Add sugar and stir it still sugar dissolved on the milk. 3. Dissolve corn flour in 3 Tbsp milk. Add the paste to the milk and keep stirring so that any lumps will not form. 4. Cook on low flame and stir in between. Continue to cook till the mixture thickens. 5. Now add the almond paste or khoya and mix well. Cook the milk till khoya melted. Now the milk mixture will become thick. 6. Now switch off the flame and let the milk mixture cool. 7. Add heavy cream and whisk it. Add mango puree and mix well. 8. Pour the mixture into kulfi mold or glasses. Spread chopped mangoes and little almond on top of the mold. 9. Cover it with lid and freeze overnight or till it set. To remove the kulfi rub it between your palms or dip the mold into warm water for 1-2 seconds. Garnish it with chopped pistachio and almond and serve it immediately.